Going to an airport can be scary if you are learning English. Even if you know a lot of English, it can sometimes be difficult to understand all the questions and conversations in an airport. 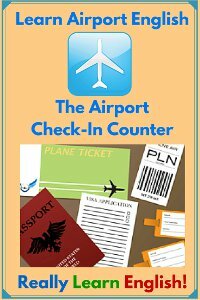 In this lesson, we will list and explain common questions and problems at the airport check-in counter. Going to an airport can be both fun and frightening when you are learning spoken English. You can practice your English at an airport, but it can also be stressful. It is important to use the right words, so you can get on your flight and arrive at your destination safely. There are many questions you may need to ask at an airport. 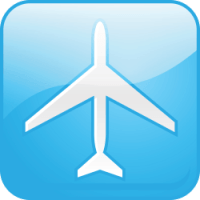 Where is the check-in counter for _______ Airlines? How long is my flight delayed? Where is the Internet lounge?  Where is the smoker's lounger? When should I be at the departure gate? Is my connecting flight on time? 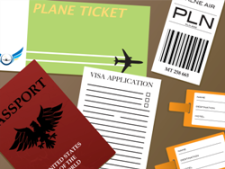 These are some common questions you may hear at the check-in counter. Do you have a photo-ID? Do you have a carry-on bag? Did you, at any time, leave your bag unattended? Is there anything fragile in your bags? Do you have any special eating requirements? Sometimes, there are problems at the check-in counter. Here are some problems you might hear at the airport check-in counter. Your luggage/baggage is too heavy. Your bag is too large. Your carry-on bag is too large. Your connecting flight is delayed. Your ID (identification) has expired. Your connecting flight is canceled.